Blacksheep's bit of the Web: We Need ... A Little Christmas....!! Gorgeous! How awesome that you've continued a tradition started by your mom. And you're right, we DO need a little Christmas! Christmas already?! What a lovely tradition. These really are pretty. We get them every year at work! I have mine hanging in my kitchen at the windows - lots of rainbow prisms all the time!! That is a beautiful ornament. I love trees that are filled with memories. My tree is definitely not a decorator tree. Even though they can be very pretty. I even have some fairly beat-up ornaments from my childhood. Love the snowflake! I have one that I rescued from the "junk table" at Dillard's one year for about $5.00! 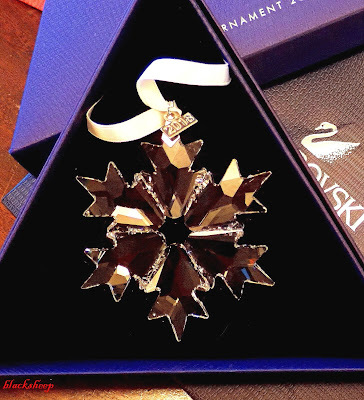 It's in that triangle shaped box, too! They shine so pretty on the tree!